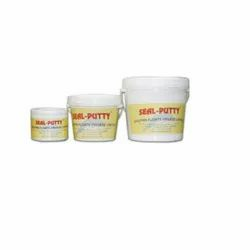 We offer Acrylic Putty that is used widely as a cost effective solution for repairing cracked plasters & brickbat coba. These are safe & easy to apply. These are also used for coating walls of water retaining structures. Brand Dolphin Floats Pvt. Ltd.
excellent adhesion to variety of surfaces such as concrete, masonry, wood, metals etc. can be used for outdoor as well as indoor applications. excellent ability to take differential thermal expansions of dissimilar materials. good uv resistance and heat resistance. filling volume: 1 kg of seal-putty-tm will fill 125 feet of 4 mm x 4 mm crack. can be painted over by all regular paints. widen & deepen the crack to about 2-3 mm in v-notch profile by mechanical grinding / milling. Clean the crack / gap of any loose materials, dirt, dust, oil etc. Compressed air or water jet can be used for this along with manual raking. the product comes in ready to use condition. fill the crack / gap fully with seal putty. tool the surfaces to get desired finish. allow curing for 12 hours prior to painting over. Looking for Acrylic Putty ?